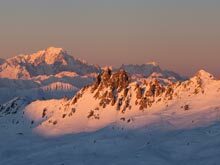 I didn't intend to post yet another 'Snow Report' from Meribel, but this time it's really good news, so here goes. IT'S ONLY BEEN BLOOMIN SNOWING. 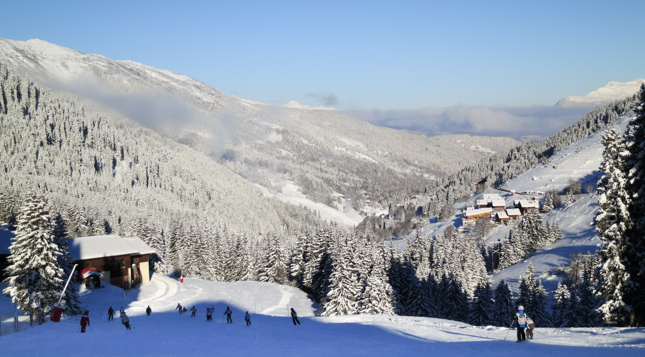 Phew, there we have it everyone, the snow conditions are fab at last all over the mountain. The lead up to the storm this weekend had been predicted for quite a while, and what a relief it was when the snow started falling. 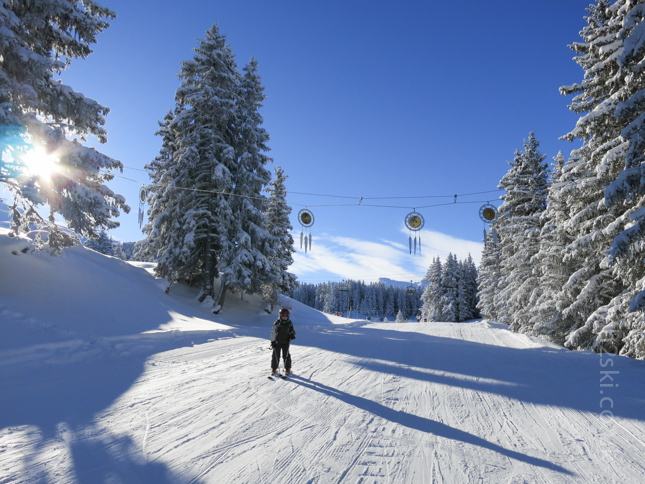 Of course my personal relief isn't what is important, good snow conditions certainly makes my job as a ski instructor much easier, but essentially great snow helps everyone enjoy their holiday even more. Even a few hours before the storm was due to arrive, we were still a little nervous that the forecasters had it all wrong. 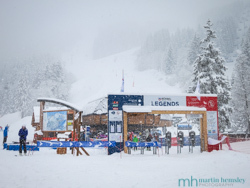 I went to bed at 10pm with clear skies and twinkly stars, but was soon woken a few hours later at 5am by the sound of the snow clearers working away on the road outside in the centre of Meribel. I trudged to work that morning, floundering across a snowy filled Chaudanne, feeling like Bambi on ice in the deep snow trying to get across to the school. And what a day I had skiing with Gilly and John. It was transfer day, being a Saturday, and the mountain was empty of people. The top half of the mountain was closed due to avalanche risk and high winds, but that didn't matter at all because we were able to sniff out some nice pitches of the gorgeous light powder snow at the side of the piste. 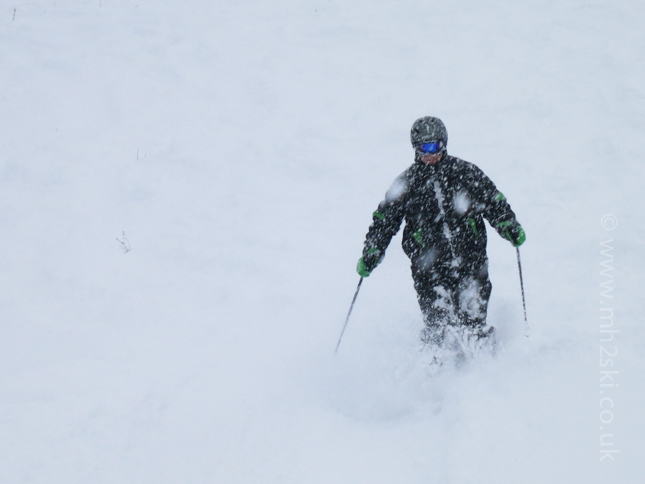 Here are Gilly and John showing us how it is done, oh and how deep the snow was. 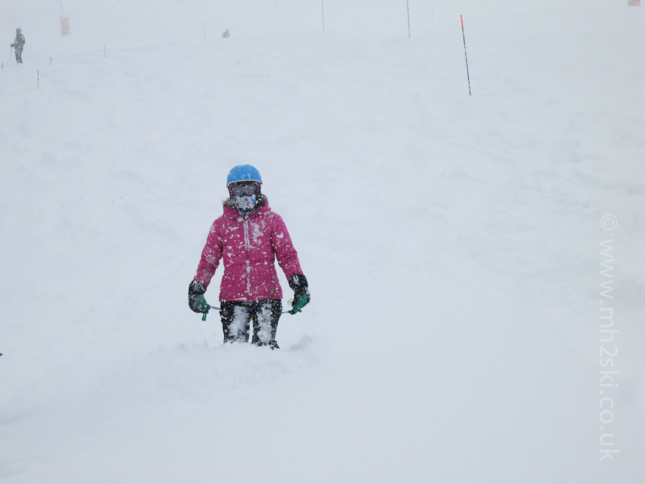 It was a fun day on the slopes, and a very welcome change in snow conditions. 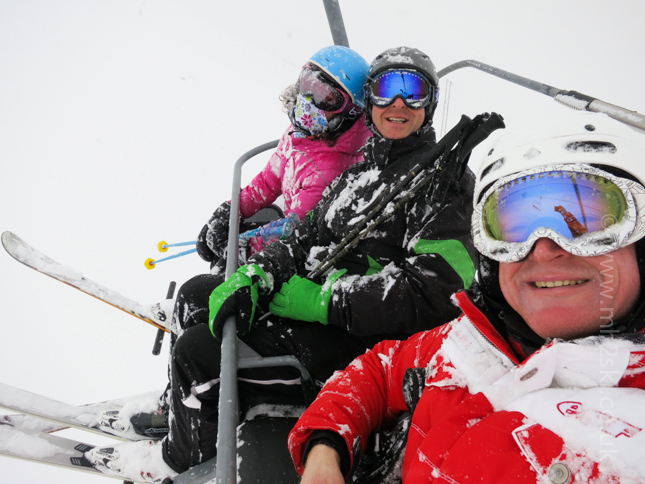 The chairlift rides were a little challenging at times, but that didn't stop us trying the obligatory 'Selfie' of course. Can't say I like the hamster look of the fella wearing the red uniform, but there you go. 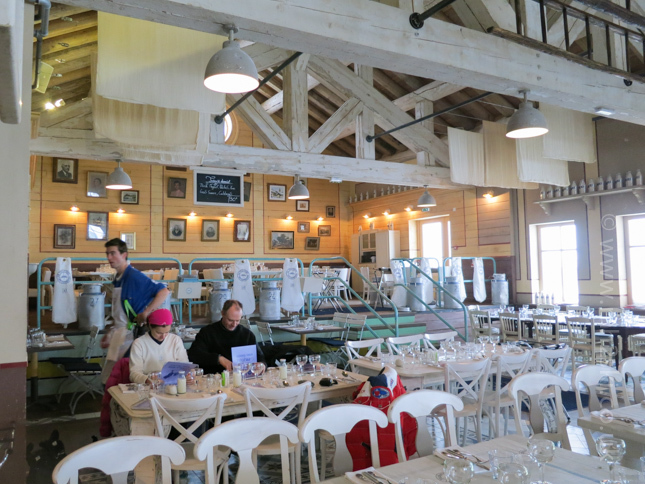 Awesome skiing in the morning was followed by an impressive lunch. 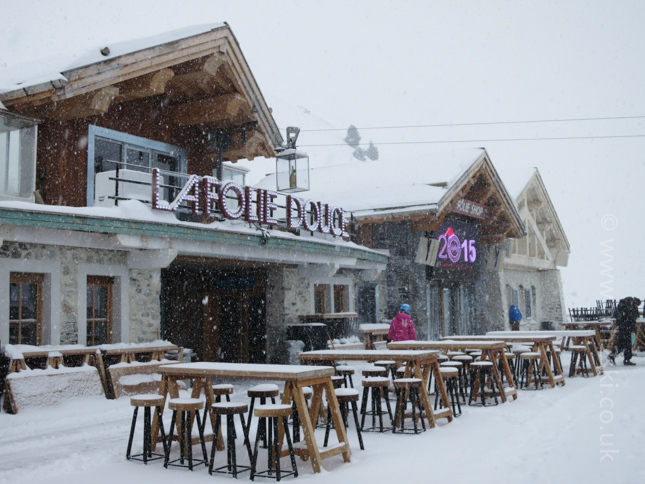 It was decided that we visit La Fruitiére restaurant which is part of La Folie Douce. 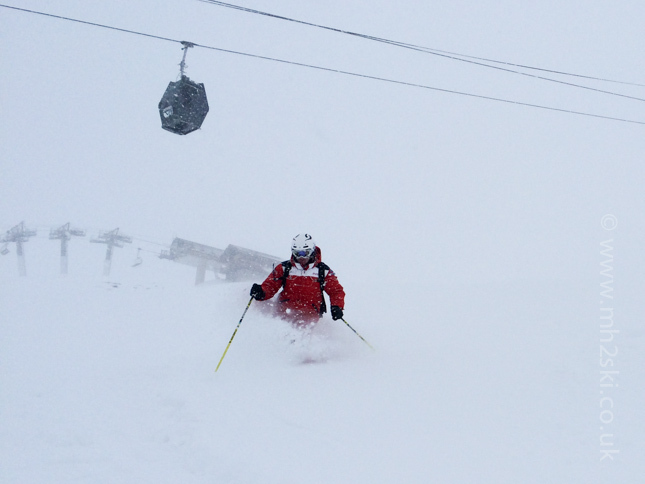 We just made it before another lift closed due to the weather. This isn't a Lunch Instructor (Michael) blog post so I'll skip the meal review - but it was good. After lunch we went back out into the storm to see what we could create. Little did we know what was going on below us down in the valley. I'm guessing that you may have heard about it; even the BBC reported the carnage on the roads over here. 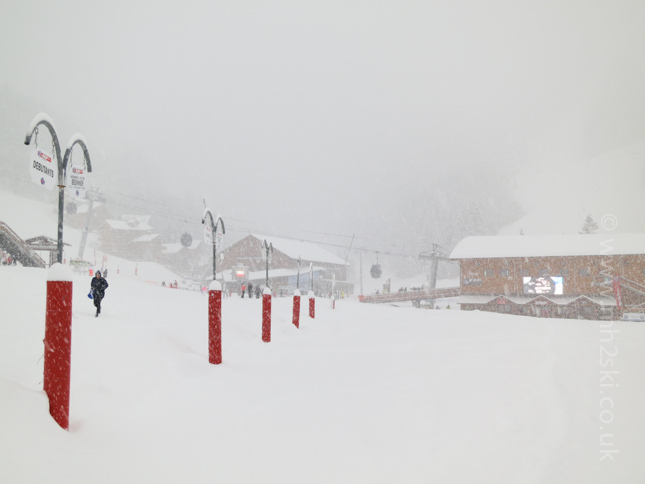 The snow storm that we were benefitting from on the mountain, was creating havoc on the raods for the New Year arrivals. Something like 15,000 vehicles ended up stranded overnight due to not being able to drive up to the ski resorts. 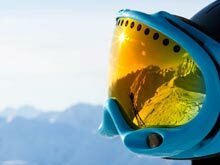 Any how, back to the afternoon's skiing. Here is yours truly captured by John on his iPhone, thanks for the photo John. Slight self indulgence there, but as you can see the snow conditions really have improved heaps. Back to the conditions down in the valley. The following day I was due to start teaching a couple of families, but received a text and email to say they were delayed a little that evening on their arrival into resort. Whilst I was in snooze land, they texted me to say they arrived at 4am the next day, and asked if they could start their lesson a little later than originally planned? In hindsight they were one of the lucky ones to make it to resort that early! However, later that day I was back on the mountain again with said family. 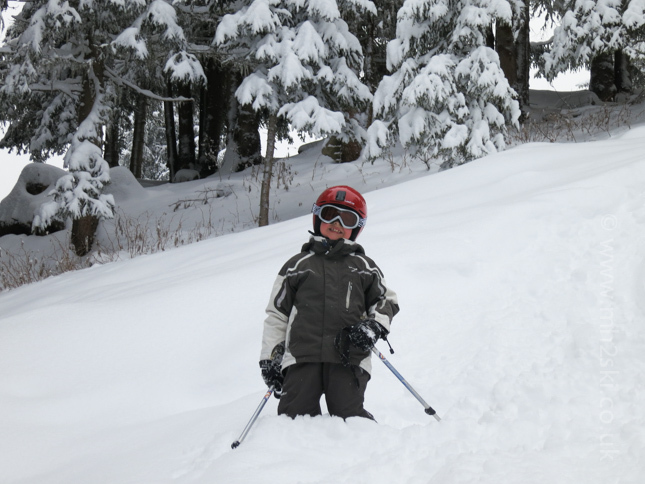 Here is Callum finding his own powder stash. So how are the conditions now? Great snow, sunny weather, and very low temps which has allowed the snow cannons to pump out snow 24 hours a day. Oh, and early indications show more snow is due again this weekend. My word this winter has turned a corner. So on that positive note, I'll stop with the 'Early Season Snow Reports' for now. Blog posts will of course continue as normal. If you enjoyed this article, you might like another from this time last year titled 'Cosmopolitan Festivies', click here for the link. Feel free to share away on Facebook, Twitter and Google+ by using the socialmedia icons. Or leave a comment below. Happy New Year to you all, and bring on the rest of the winter. Martin.